Travelling with allergies both food and environmental is just something we have to live with and plan for. We have allergies and intolerances to a variety of food substances within all members of our family. Travelling with our eldest when he was a toddler was really quite hard as he was allergic to eggs and peanuts. We were also gluten and dairy free for many years from when our second son was only 6 months old. We have remained gluten and peanut free as a whole family. The peanuts we avoid as our eldest suffers anaphylaxis to peanuts and we carry an epi-pen for him. Gluten we avoid whenever and wherever possible because it makes us all unwell in a variety of ways! When they were younger and I took Jack and Tom to the UK from New Zealand solo we had a really hard time with customs officials in the UK. The 100ml regulations had only recently been introduced – maybe a post for another day! Flying with children and allergies is not easy, neither is it impossible – with careful planning it can be reasonably hassle free. We bought allergy awareness T-shirts and badges for flying and had an allergy ID bracelet made up by Star Allergy Alerts (see Ad below). Measures to hopefully prevent well-meaning friendly people from feeding them treats while I was sleeping (Tom was still a baby)! Travelling with allergies is not straight forward but it is possible with planning. Each country we visit or have lived in will likely get a post about sourcing gluten free, LCHF (Low Carb Healthy/High Fat) foods. Will also cover how easy it is to source the extras we love e.g. coconut oil and unfiltered apple cider vinegar (with the mother). We will also look at including information on sourcing replacment Epi-pens as this becomes an issue with expiry dates. I will post links on this page when I remember or you could always use the search function to drag them out of the archives. Fast forward to today and Jack still requires an Epi-pen for peanut exposure but can eat eggs, which is good because he loves eggs! We still restrict gluten pretty much 99% of the time. We have noticed that over the years the physical reactions to gluten have minimised. We do wonder if it may be more a preservative issue in the gluten containing foods now than the gluten protein itself? Or if we have simply allowed sufficient time for our guts to heal and replenish with good bacteria and enzymes. 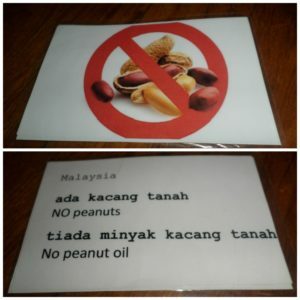 I made up these signs to try and help keep Jack safe in Malaysia when eating out! Tom is still allergic to cats as am I and we all suffer a little with seasonal and allergic rhinitis from pollens and dustmites. I have to say that early evidence would suggest that our transition through Paleo to LCHF and now onto a ketogenic way of eating have reduced these symptoms. Need more time and trials though! Our history of allergy and intolerance. Our story with allergies, both food and environmental has been a long one – I could write a book and probably will one day. If interested you can read more detail about our allergy journey further down the page. I think a bit of background is useful for you to understand our journey and current situation. Our whole family has certain sensitivities to our environment. Whether they are allergies or intolerances it matters not; they affect our lives and often on a daily basis. Their effects can also be cumulative. We have tried various remedies or fixes to reduce the stress on all of our bodies. Allergies to dustmites, cats, pollen, eggs and peanuts along with sensitivity to gluten and dairy made for a challenging early few years! A variety of diet changes and elimination of environmental chemicals have made life more comfortable. We did this it helped! We were already peanut and egg free due to hives and anaphylaxis early in our journey. When we received the Aspergers diagnosis we embarked on a GFCF (gluten free/casein free) diet after reading a book by 12 year old Luke Jackson with Aspergers. Not quite enough for us so we looked into FAILSAFE (FAILSAFE stands for Free of Additives, Low in Salicylates, Amines and Flavour Enhancers) and employed those principles. 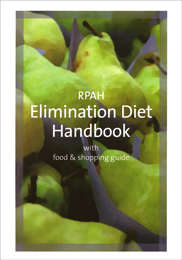 One step further was the RPAH elimination diet – now that was bland for many months! It worked though and we got most symptoms under control and figured out a few food triggers. The images below will take you to the book on Amazon or a website where you can purchase. These were the 4 main books that have helped us the most to take back control of our health. Phew…because next step was full GAPS and that was a whole heap of extra research and challenges! Our allergy journey started when Jack reacted badly to peanut butter at just 8 months old! On further testing we discovered he was also allergic to eggs, dustmites and various pollens. Hence, began years of diet and environmental adjustments to ease symptoms and improve his quality of life. Tom has also skin tested positive for a variety of common allergens:pollen, dustmites and cats – foods he seems to be ok with! Jack is still anaphylactic to peanut so we carry two epi-pens and never run out of anthistamine or ventolin. He has outgrown his egg allergy and seems much more tolerant to dustmites and pollens. Occasionally he will react to too many sulphites in his food. Whatever chemicals seem to be on some fruit skins especially apples (probably a pesticide or preservative) have also caused lip swelling! Egg allergy, peanut anaphylaxis, pollens and dustmites! The most common food allergens are milk, egg and peanuts. Jack was allergic as a toddler to egg and peanuts. At 8 months old he had his first severe reaction to peanuts after eating a small amount of peanut butter on toast. At the time the advice was, ‘that if there was NO history of peanut allergy in the family then peanut butter was fine’. However, common advice now is to avoid the 8 common allergens for at least 2 years if there is ANY history of ANY allergy, eczema or asthma in the parents! With my history we would have been much more hesitant and careful with our introduction of potentially allergenic foods. On our allergy journey we have spent many years trying to help Jack and Tom mostly by avoiding the allergens. Hot washing sheets frequently, anti-dustmite mattress covers and pillowcase (we travel with an anti-dustmite pillowcase each), freezing soft toys just became normal. They suffered terribly with eczema, recurrent ear infections, virally induced wheeze attacks – later diagnosed and treated as asthma. It was not until we received a diagnosis of Aspergers at aged 2 1/2 years that we investigated gluten and dairy as possible issues in Jack’s diet along with artificial colours, additives and preservatives. For many years we followed the principals of FAILSAFE and the GF/CF diet and had much success with reduced symptoms across behaviour and health. We reduced (tried to eliminate all environmental chemicals and possible allergens too). Examples of anti-dustmite pillow covers are available on Amazon – see ad below. If you make any purchase on Amazon through on our links we get a small commission and it doesn’t cost you a cent extra. Thanks for your support we really appreciate it! Our allergy journey has involved numerous changes to our diet. We did the Royal Prince Alfred Hospital (RPAH) elimination diet when we needed to take things further and drastically reduced our intake of natural food chemicals such as glutamates, salicylates and amines. We spent quite a few months living on not more much variety than chicken, leeks, rice, cucumber and pears – it was a very pale diet! In addition, after research our cat went on a trial holiday to the grandparents and is still there 8 years later as the boys stopped getting ear infections and tonsillitis monthly, in fact never had another attack! Also a bonus in quitting dairy was that Tom stopped projectile vomiting. We did not know then that dairy and gluten could be so problematic for our health. Asthma, eczema and hospital visits! Both older boys suffered terribly in the early years with repeated hospital visits for unidentifiable causes of high temperatures, strange rashes and virally induced wheezes (later diagnosed as asthmatic episodes – as they responded well to nebulisers, oxygen and ventolin). Tom had terrible eczema at times which would get so itchy and infected from scratching. The worst was when he developed a bacterial infection all over his legs (impetigo) and we had to wet wrap him for months and apply strong steroid creams.We even had to resort to sewing cotton gloves to his pyjamas! So much more under control now with diet and probiotics, it is hardly a problem at all. We have sourced a shelf stable probiotic that does not require refrigeration so great for travel and healing after a bout of illness or when something triggers itchy skin. Our brand of choice from Australia’s Chemist Warehouse was Naturopathica GastroHealth but sadly our supplies are running low and we have been unable to source more so far so will need to consider something like these from Amazon. Unless our local Herbalorio can help! 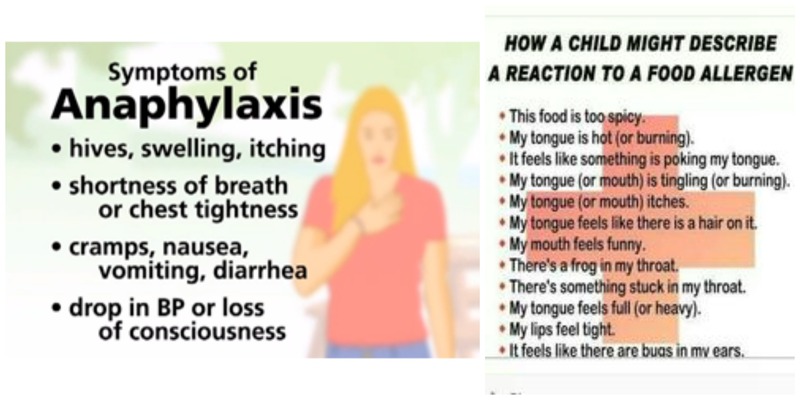 Experiencing Anaphylaxis Once Is Enough Thank You! Only once have I had to administer Jack’s Epi-Pen. It is an experience we both would prefer never to happen again. It was very frightening and the result of one of my worst days as a mother ever. It was all my fault. I bought nut bars and only double-checked the ingredients not triple-checked! I somehow missed in my sleep deprived the fact that the bar was nearly 50% peanuts! We were driving from one class to another and he had eaten the whole thing before stating his throat was kinda scratchy. At this point I panicked realising I had switched bags that morning and left his Epi-Pen on the counter at home. We were 2 minutes from, so I drove home grabbed the Epi-Pen (Jack was ok at this point a little panicky). I was still panicking so drove back to the class we just left run by a very good friend after telling her to get me an ambulance. Police and Ambulance Support for Anaphylaxis! My driving attracted the attention of the local police – my friend explained the situation and that an ambulance had been called. By now Jack was coming out in a rash and his throat and lips were swelling. Although his breathing was OK we decided to administer the Epi-Pen. The ambulance arrived and leaving my car and middle two children with my friend I went in the ambulance with the baby and Jack. It is policy in Queensland, Australia to take anyone who has had an Epi-Pen administered to hospital for monitoring. So glad they did because it got much worse! The next 8 hours or so were horrendous as Jack’s body fought the peanuts. After the first dose of epinephrine ran out he broke out in hives, they spread and became so large he was just one big hive. Hives were followed by the intensely itchy, red, hot rash. He looked like he had sunburn. The staff gave large anti-histamine doses and steroids I think. He vomited and from then on things seemed to calm down. Full body ice-packs helped the itching a little. After hours of monitoring for a secondary reaction he was admitted to a ward. His poor little body was so hungry he ate everything the nurses could find for him that was gluten free. I do honestly believe that his reaction to a trace amount of peanuts would be minimal and controllable with anti-histamine. A situation neither of us which to test or repeat. We have discussed desensitisation under medical supervision with him but he’s not keen. So for now we will continue to carry two epi-pens and antihistamine wherever we go! The photo below is Jack looking rather pale and washed out from his ordeal being comforted by little brother George. 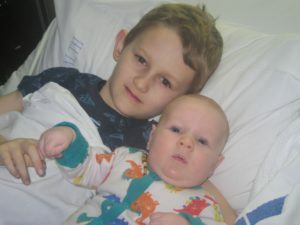 Jack in hospital post peanut induced anaphylaxis being comforted by little brother George! An allergy is a life threatening reaction to an allergen. itchy skin or a raised, red skin rash. swollen eyes, lips, hands and feet. swelling of the mouth, throat or tongue, which can cause breathing and swallowing difficulties. We shall not take up more space discussing our allergy journey here. We have spent years researching, lots of money on specialists and tests and have recently found this UK allergy website to be a good summary of current thoughts around allergies and intolerances. A friend from Australia who also travels with a child with allergies and is a travel counsellor shared this great website link recently. The www.foodallergy.org website has some fabulous resources for people travelling internationally with allergies. to the US, Hong Kong, Italy, Mexico, New Zealand and the United Kingdom. These resources were developed in collaboration with their International Food Allergy & Anaphylaxis Alliance partners. Hopefully they will continue to add more destinations. Over the last 8 years or so we have progressed through a number of dietary changes to assist our gut and bodies to heal. If we knew then what we know now, we would have explored a ketogenic diet much sooner in our timeline. It has not been easy but with continued research “never stop learning” and perseverance we believe we can heal completely and stay well away from many modern illnesses! If hearing a little about our journey can assist with your own health or healing, then sharing will have been a good thing for us. We truly believe that all our family has benefited from these changes and certainly the health of the 3rd and 4th children has been significantly better than the 1st and 2nd! Our overall health and well-being has improved too with finally ditching grains and not just gluten! 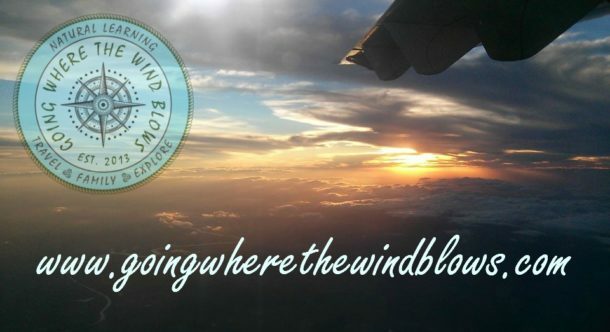 Follow us for more about our allergy journey and adventures in finding ‘safe’ food whilst we explore the world. Subscribe to our newsletter – there is a link at the top of the page or one of those annoying pop-up boxes is around here somewhere! One goal is to be able to sample traditional national dishes without compromising our long term health journey! Disclaimer: please know that we are not qualified medical professionals just concerned parents with our family health at the core of our research and decision making. If you suffer from serious health issues e.g. diabetes please consult a professional before making diet changes. NB Not all links are affiliate links, some are purely for your information. Links to posts with allergy and diet information.